A Peter Symonds student has been offered an unconditional place to study at Harvard University, one of the world's most prestigious universities. Adam Corcoran, an Upper Sixth student, has made it through the rigorous selection process as one of the few UK A Level students to be offered a place at the successful ivy-league university in America. Out of approximately 500 applications from the UK, only 30-40 applicants are admitted per year. Like many US universities, Harvard allows students to study any subjects they please for 18 months. They then choose their favoured subject to study for their remaining 2.5 years. Stuart Gordon, Head of Harvard UK Outreach added, “This is one of the biggest attractions for our international students, they simply get offered a place at the university, so they can study anything. It gives them a ‘try before they buy’ outlook which they really value”. 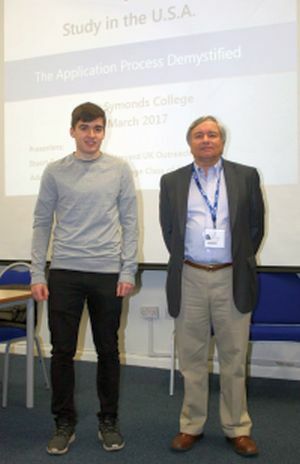 The reason for Stuart’s visit to the College was to talk to interested students about applying to US universities and what they may expect if they are offered a place. In the wake of Peter Symonds Progression Fair and Careers Week, students are earnestly considering their options for their futures and Adam’s story is inspirational to others considering a similar path. The Peter Symonds Careers Department offer students the resources to explore a very wide variety of options available to them, including studying abroad. Adam continues, “The Careers Department offered me lots of resources and guidance on the application process, which was really helpful”. Adam will head across the pond in August and for his first year he will board at one of the university’s residential houses in Harvard Yard, which is at the centre of the university campus in the city of Cambridge, Massachusetts, adjacent to Boston.